Taking time-exposure pictures at the public outside the Rex Hotel, and having a five year old boy and his three year old sister come over from their family to see what I was doing. The curious boy wanted to play with the camera, so I set things up and was letting him push buttons. He and his sister would squeal with delight after the flash went off and they could look at the image in the screen. Thank goodness for strong batteries. Eating fresh grilled prawns at a smoky barbeque restaurant. The half-kilo of prawns arrived in a plastic bag, still alive and jumping about. The waiter then showed us how to grab the prawns, turn them over, and use a toothpick to sever their main nerve before throwing them on the table-top grill. Watching them continue twitching for the next half-minute was a macabre experience but made for really, really fresh food. Taking a break from the afternoon heat and stopping at the buttercup yellow Fanny’s two days in a row – and enjoying locally-made cinnamon and young rice ice cream while sitting on the covered patio with fans blowing a strong breeze and drinking ice-cold water. Watching young couples gather on their mopeds at the park, hundreds of them, finding a little bit of private time together away from their families. They perched on the bikes, cradled in each others’ arms, enjoying privacy in a crowded public place. Viet Nam is a fascinating place and I’m eager to return, next time to see Ha Noi and Ha Long Bay. Stay tuned for pictures. It is a warm Saturday afternoon in Ho Chi Minh City (hereafter abbreviated to HCMC) and the air-conditioned comfort of an internet cafe is the extent of my adventurousness as Tawn and Ryan both take naps at the hotel after a morning of sightseeing. While they say Ha Noi shows it more, the influence of French colonialism on HCMC is unmistakable. The grand boulevards, roundabouts, epic government buildings, French bread sandwiches, and strong coffee are testaments to the French. And the Vietnamese have taken these things and done well with them, adding their own style. Traffic is worse than Bangkok, but not. There are many, many more streets than in Bangkok but they are mostly smaller streets, a lane or two in each direction. But they are filled with more mopeds and bicycles than you could imagine. And they drive fast! A common sight, one I’m still trying to get a decent photo of, is a family of four perched on a single moped: Dad driving, Mom sitting behind him, holding tight to the toddler who is standing between Mom and Dad, then junior is sitting behind Mom. The young ladies dressed in their ao doi and conical hats are incredibly beautiful. Vietnamese, like many Asians, seem to place a premium on avoiding sun exposure. So the young ladies are dressed in elegant, long-sleeved dresses that cover a long pair of pants. These are often silk and are always white. They even ride the mopeds (or drive them!) wearing these outfits and the outfits make the action of driving through the traffic look that much more graceful. Vietnamese who hawk to tourists are incredibly pushy and direct, to the point of annoyance. Everyone else, though, is incredibly inviting and welcoming. We ate dinner at a very out of the way outdoor restaurant, located 100 meters down a side alley away from the tourist district. It specialises in banh xeo, a rice flour crepe filled with shrimp and bean sprouts and served with a heaping plate of lettuce, basil, mint and other greens. You use the lettuce as a wrapper and place the herbs, banh xeo, and fish sauce and vinegar condiments inside and eat as a mini burrito. The waiter came over several times to help guide us through the intricacies of using the wide array of condiments and our meal was all the more enjoyable for it. The visit today to the War Remnants Museum was a depressing one. It is the chronicling of the atrocities committed against the Vietnamese people by the Chinese, French, and Americans. As you might imagine, it presents one side of the story, although I’m hard pressed to really understand what the other side of the story (the Chinese, French and American one) is. Most of the photos and documentary evidence are from non-Vietnamese sources such as the Associated Press and United Press International. In all, it captures well the high price paid for war, a toll bourne particularly by civilians. The visit was a sobering one, and it was particularly impactful on our friend Ryan, who fled Vietnam with part of his family in 1977. I cannot fully imagine the feelings associated with seeing the images of brutality inflicted on your native country by foreign powers, and am thankful I’ve never had to live that nightmare. Certainly it is a reminder that every man and woman has the responsibility to raise his or her voice in support of peace and non-violence. The remainder of our trip is unstructured, but we still have two full days. A visit to Cholon, the Chinese district of HCMC where Ryan grew up, is a likely event. Both to see what he remembers of it, likely not much, as well as to see the largest market in HCMC. Coffee, a Vietnamese specialty, is on my shopping list. Pictures will be added once I return to Bangkok. Wow! What a whirlwind week. We’ve had multiple guests in town, one of whom (Ryan) has been staying in our living room. It’s been a lot of fun having guests, and with Thai language school getting tougher and tougher, there’s been a lot occupying my mind other than blogging. But I’ll get back on track with that. This morning Tawn, Ryan and I leave for Ho Chi Minh City, Vietnam. This will be Ryan’s first trip back since he and his family fled the country in 1977. Should be a very interesting trip. When I return I’ll have several days in town before heading off to the US for the SF International Asian American Film Festival, so will be sure to update the blog then. Check back soon! Valentine’s was another in a busy series of days that will continue for the next two weeks or so. After school and work, Tawn and I met at the Thong Lor Skytrain station about 6:40 and walked to Face – a very cool restaurant complex that features Thai food in one restaurant, Indian in another, and a bar, all in a series of restored Northern Thai-style houses. The food is good, albeit a bit under-spiced, and the atmosphere is great. We were meeting Tod and a couple he has visiting from San Francisco, Monty and Dave. Monty works for Yahoo and Dave for Apple. They’re a nice couple and we’ll see them again over the next few days of their visit – pictures of them then. Tawn had prepared a very nice Valentine’s Day present for me – a suprise night at the Central Sofitel up in Lad Prao, about halfway to the airport. It is a nice hotel. Unfortunately, dinner didn’t wrap up until almost 10 and we both had an early morning and decided it wasn’t worth the effort to drive up there and then have to fight traffic back in the morning. Still, a really thoughtful present. Below: Our apartment on Soi Asoke. Flower arrangements by Tawn. Above: Tod joins Tawn for a smaller dinner two Sundays ago, before our trip to the Opera. The menu: Spanish tortilla, pan-seared white fish with a tomato-chili compote, and sauteed mixed mushrooms. 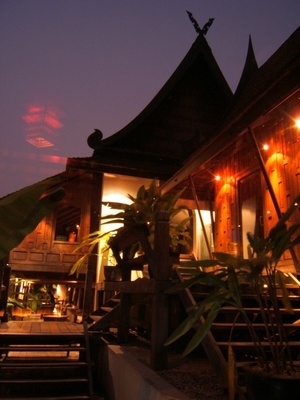 Below: Dusk descends upon the Face restaurant complex, a Thai restaurant, an Indian restaurant, and a bar located in restored Northern Thai-style houses in the Thong Lor district. 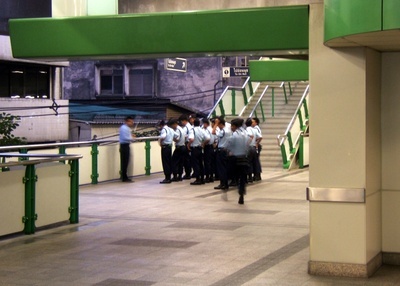 Above: Shift change for security guards at the Thong Lor Skytrain station. 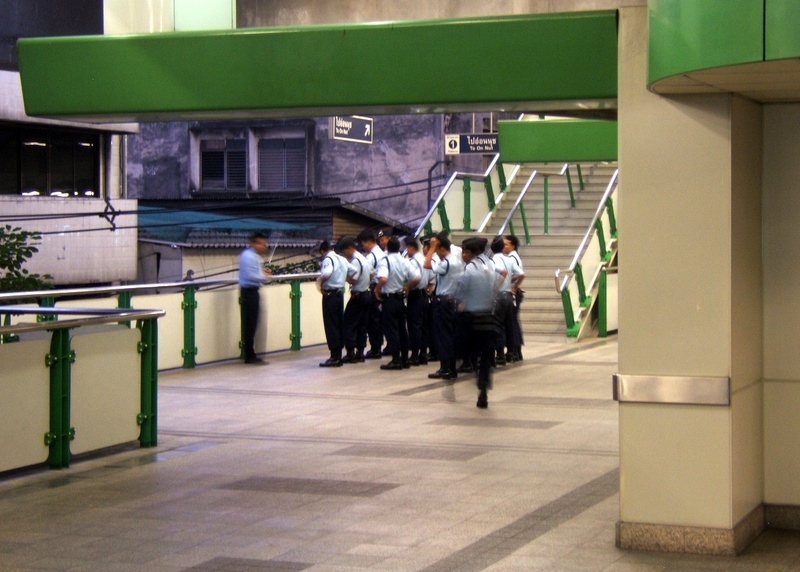 Militaristic formality among security guards is a feature of Thai culture. They lined up, did some “about-faces” and then went on their way after a briefing. All done with the characteristic sabai-sabai attitude. Had some final communications with Ryan, who arrives tomorrow morning. If all went well, his first flight should have departed about two hours ago. His ankle is feeling better, but I don’t know if he’ll continue his plans to go scuba diving. Right now, the plan is to combine all of our guests into one group on Friday and do the Grand Palace, Wat Po, Wat Arun tours in one fell swoop. More people arriving soon: Paul Thies is back to visit his girlfriend Aori on Monday, and then Chi-hui Yang (director of the SF Int’l Asian American Film Festival) has a friend in town next week and asked if he could give him my number. Busy time of year. Must be winter in the US! Very odd that it was drizzling this morning when I woke up and then continued through the first half of the day. Normally in Thailand the mornings are dry and any rain comes in tropical afternoon storms. It was also quite cool all day, breezy and overcast. The high was listed as 30 C / 86 F but I don’t believe it. At 7:30 pm it is only 24 C / 75 F and I don’t think the temperature dropped that much this afternoon. Must be sympathy for the eastern United States. Today is Wan Makha Bhucha, an important Buddhist holy day marking the auspicious occasion when 1,250 of Buddha’s adherents spontaneously congregated to hear him give a sermon. Merit-making ceremonies are held during the day at temples throughout the country, while at night, triple candlelit circumambulations (walking around the temple three times) are staged around major temples. So it is holiday from work for Tawn and the rest of the Kingdom. For me, it is still a work day, but at least I don’t have to go to class in the morning. Where to Get a Guest Mattress? With our friend Ryan arriving from the US on Thursday morning, it was time for us to finally get some sort of guest accommodations. We had explored many options, from buying a hide-a-bed sofa, to getting a futon sofa – those both were ruled out because they are pretty uncommon here and Tawn had his heart set on the leather sofa we ended up with. We had also looked around for more Japanese-style futons, but the only “temporary” beds they have are really insufficient pads that would be the source of instant backache. Then a few weeks ago, while we were at the massage place on Soi 23, I noticed that the massage mattresses – about the size of a twin mattress but only about 3 inches thick – were very comfortable, firm but with just a little give to them. Of course, I failed to enquire about where one buys massage mattresses while I was at the massage parlor. When I returned this past Friday, the English-speaking manager was away for the long weekend. Thanks to Tod, who was available via hand phone, the ladies working the massage parlor understood what I was looking for, which apparently is not the kind of question one normally receives at a massage parlor. One of the ladies was making a not for her manager with my number when the other one remembered they had a unused mattress in the storage room, so she took me upstairs to see it and sure enough, it had the tag of a distributor on it. Everything was in Thai except the name of the company and the phone number. So I wrote it down, thanked the ladies profusely (they had brought out a cool towel and a glass of iced tea, thinking I was a customer), and headed home. It turns out the mom and pop business is located on Thanon Srinakarin, way, way out to the East of the city halfway to the new airport. It wasn’t too hard to find, although making a U-turn on Srinakarin, which is basically a 3-lane highway with business along it, was a nightmare. 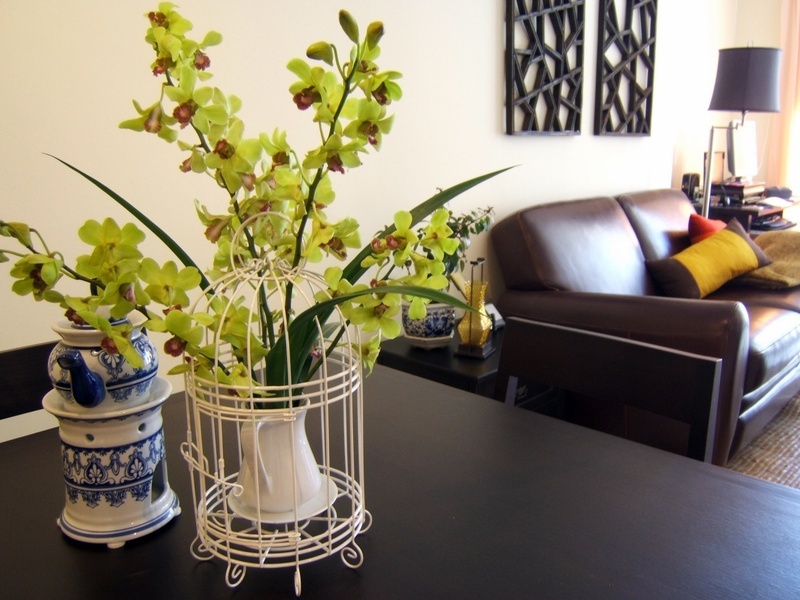 The owner was very enthusiastic and appreciative of the referral from the massage place. I get the impression he doesn’t do a lot of retail business, mostly wholesale. So we arranged to buy one of the slightly wider than twin size mattresses, paid an extra 300 baht ($8.00) to have it delivered, and headed home. Saturday evening, Tawn had a dinner function with his colleagues from the China offices of H&K. 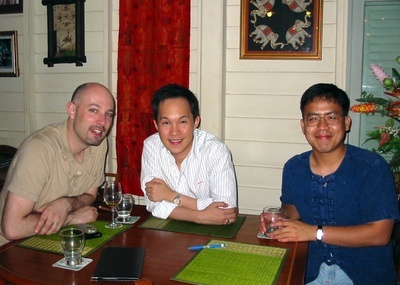 You may recall that back in December, we made a trip to South Korea with Tawn’s office mates here in Bangkok. The trip made by the Chinese employees was the same sort of annual “thank you” trip, but they chose to come to Bangkok for their holiday. There was a dinner held at a nice Thai restaurant over on Thanon Sathorn for the entire group, which numbered about 100 plus the people from the Bangkok office who decided to join. Because various VPs and other important people from the company would be there, Tawn saw it as a networking opportunity and attended. Somewhat as I predicted, it was not a simple “I’ll be back by 8:30” type of affair. The group then went to see some cabaret show (with female impersonators, think La Cage aux Folles) and then were heading to yet another destination when Tawn was finally able to beg off and head home at about 11:00. Since Tawn was not going to be at home, I was facing the prospects of a relatively boring evening. Fortunately, though, when we got out of our late afternoon yoga class I saw that I had a missed call from Rick Yang, one of our flight attendant friends at United. He was in town and would be free for dinner after 8. Rick and I met up at Bella Napoli, our favorite Italian pizza place over on Sukhumvit Soi 31, a 15-minute walk from home. He’s been busy with work and is dating a guy in Bangkok (so that would be long distance from Taiwan) who, interestingly, is from the same province, Buriram, as Tawn’s father. Since Rick had a 5:00 am pick up time (United’s only daily departure is at 6:45 am, way too early), he headed back to the hotel right after dinner. I took the Skytrain back and waited another hour for Tawn to arrive. Ambitious plans that are half-fulfilled. That’s the answer. We did get our weekly shopping trip to Carrefour, France’s answer to WalMart and then headed down to Siam Square, the heart of the shopping district, to meet Tod for a movie. We had taken a taxi but traffic was so heavy on Sukhumvit that as we approached the Nana Skytrain station the driver suggested we should probably just take the Skytrain instead – very cost-conscious of the driver. Tod arrived at the grand old Lido before us and bought the 100 baht tickets for the 2:00 showing of “Prime”, the Meryl Streep and Uma Thurman comedy/romance/drama. As we exited the cinema (the film was okay, pretty good storyline but the screenplay itself was choppy and not fully developed) we discovered there was a torrential downpour and the streets were quickly flooding. Trapped without umbrellas – there hasn’t been rain in Bangkok since before Christmas so why would we be carrying them? – our only option was to duck into a Pizza Hut for a quick lunch. This is the only time I’ve eaten Pizza Hut in years and I’m terminally embarrassed to eat there while overseas. Our plan was to go across the street to the new Siam Paragon shopping center, where the Bangkok Int’l Film Festival was hosting a free outdoor screening of West Side Story. The rain washed those plans away, unfortunately. So we completed a few shopping errands and then headed home once the rain had stopped. The evening concluded with a trip to the local massage place for a one-hour foot and leg massage and then we ate al fresco pad thai at the street vendor who sets up each night outside the 7-11. Yummy, but we didn’t drink the water they served us which Tawn warned was tap water. Thankfully, with 7-11 right there, we just purchased some beverages and brought them outside. The final accomplishment for the night was to install and test the two web cameras I purchased. Now Tawn and I are both up on Skype and can stay in touch with each other for free while I’m in the US next month. Then we’ll leave one camera and headset in the US for my sister and her family to use. First things first, even though I seem to be increasingly in the delayed picture posting mode, here is a picture of Ryeroam (Jaturong), the Thai guy in Mexico who I’ve been chatting with through airliners.net. 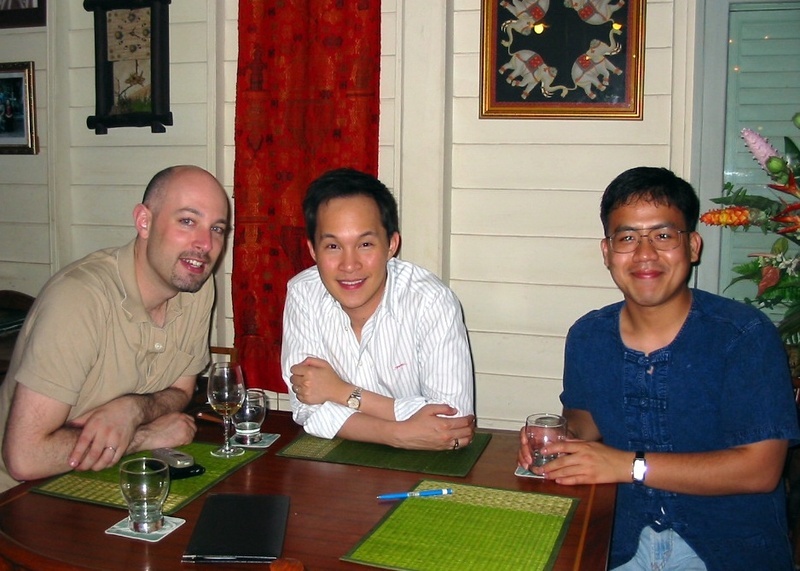 As you may recall, he was here in Bangkok a week ago visiting his family and Tawn and I met him for coffee and dinner. Not having my digital camera with me, I had to wait for his return home to receive the pictures. The first of his trip reports on his round-the-world journey has been posted on a.net. Click on the photo for a larger view. For millions of people each day, receiving a package from United Parcel Service or UPS, is a routine occurrence. The clean, professional brown-clad drivers pull up in their clean, professional brown-painted vans and trucks, scan the packages with their rugged brown computer devices, have you sign your name, and then hop back in their trucks with you left holding the bag… or the box, as is more usually the case. But then yesterday, I needed more information that what I already had and that is where I encountered and was stunned by the level of technological sophistication that exists in this world. 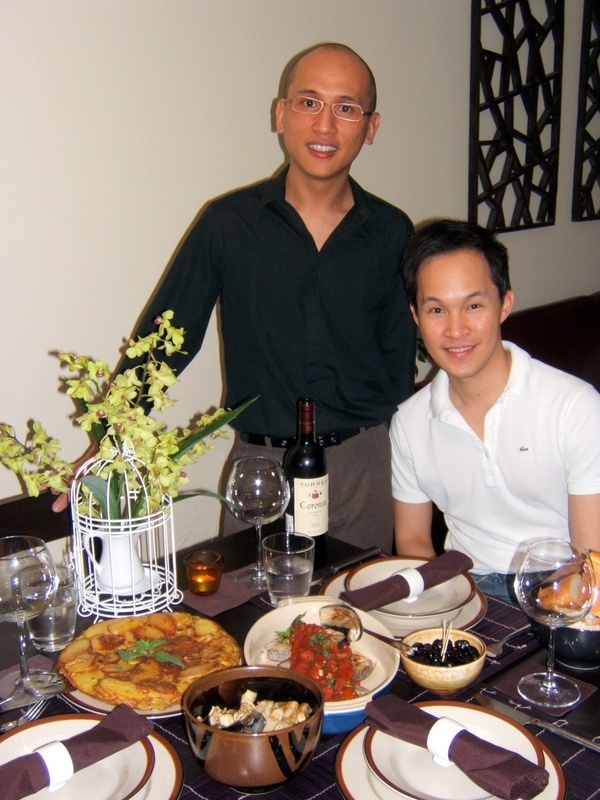 Ryan Lam, a high school friend whom I first met as Chien Tang (and later became Chien Lam en route to becoming Ryan Lam – an interesting story that is probably not mine to share with you), will be arriving here next Thursday for a two-week visit. Always one to take advantage of any carrying capacity someone has in his or her Bangkok-bound suitcase, I asked if he would be willing to bring over some coffee. Tawn and I are big fans of Royal Blue Organics’ Cafe Mam coffee – organically produced, shade-grown coffee cultivated on small, family-owned farms in Chiapas, Mexico. RBO is a small operation out of Eugene, Oregon and I was first turned on to the coffee when I first moved to 330 Eureka in San Francisco. Nina Hall, Colleen Brennan (now Connors) and Anita Mak were my roommates and Nina had discovered this coffee from her days at UC Berkeley and was ordering it. Once Nina left the States, I continued to order and have done so faithfully since then. RBO is the nice kind of small business that you can just email or phone and say, “Hi, it’s Chris in San Francisco – can you send me five pounds of Italian Roast, whole bean?” and that’s all you need to say to place the order. Since Ryan was willing to bring over the coffee, I went ahead and dropped Erin at RBO a line and she made sure the coffee was roasted the same day and shipped out. So back to yesterday, Ryan and I were exchanging emails in preparation for his visit and he asked when the coffee would arrive. Erin had emailed that it would be there no later than Tuesday – the day before Ryan departs for Khrungthep – but it occurred to me that since it was travelling by UPS I could actually track it. And that’s when my revelation occurred. 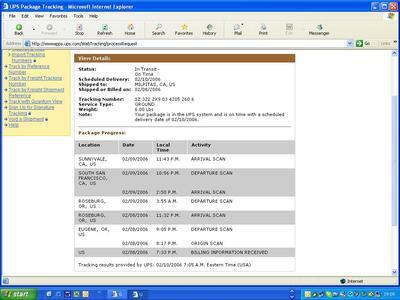 Copying the tracking number from Erin’s email, I went to the UPS website and entered the number into a tracking field on the home page. 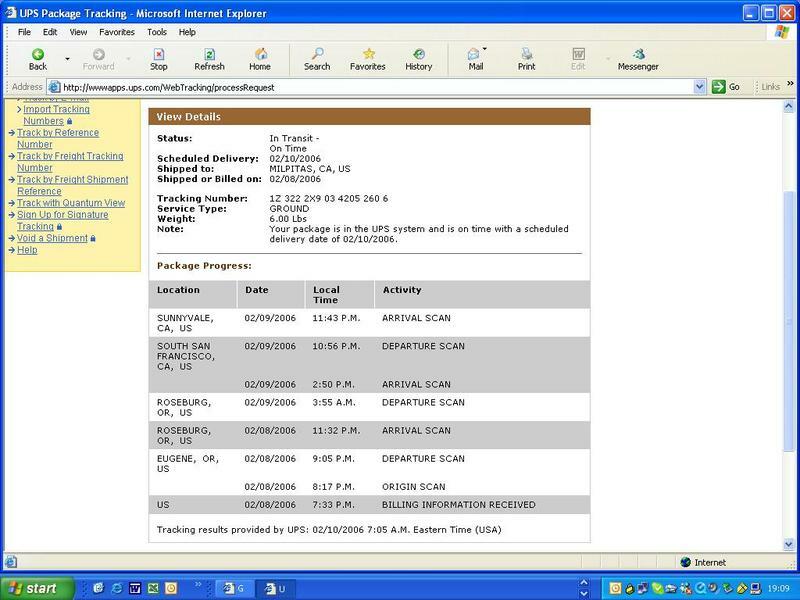 The results astounded me (screenshot attached): I was able to trace the package on ever step of its journey from Eugene to Milpitas, and could tell that at the particular moment that I replied to Ryan’s email, the box was at the UPS sorting facility in Sunnyvale and would be delivered to his house, six or seven miles away, the following day. What incredible detail. Now the rest of you may well be sitting here (espcially you high-tech types) thinking, “Duh, that’s been around for ages!” But you have to understand that the last time I used UPS to track a package, it just simply had some text saying something like “In Transit.” I’ve never been able to see such explicit detail on my package’s progress and I would imagine that if the package was misrouted or lost along the way, I’d be able to see that, too. That, I think, is the ultimate in transparency. This lets the customer see the company’s performance in near real-time. Now I know how you’re doing with the business I give you. This, in my mind, is immensely cool.